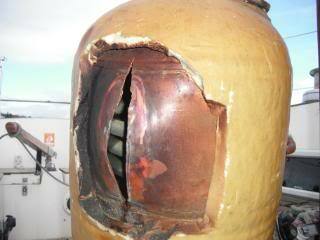 Hot water is pumped from the engine water jacket to a coil in the calorifier, then returned to the engine. Cold water from the boat’s fresh water supply is heated by the coil inside the calorifier for domestic use. Directly-cooled (raw water cooled) or indirectly cooled (fresh water cooled) engines can be used in conjunction with a calorifier but in the case of directly cooled engines the installation usually requires additional equipment. In cases where the calorifier is installed beneath the engine there may be a need for extra measures, such as a non-return valve or a hose loop below the base of the calorifier, to prevent loss of heat from the calorifier into the engine by convection. 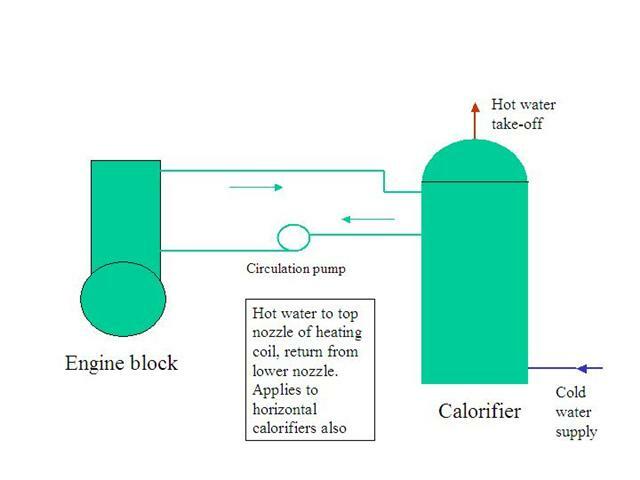 Small, single-cylinder engines may not generate sufficient heat to run a calorifier. The result can be that the engine runs very cool, with detrimental effects on wear and fuel consumption. Calorifiers are supplied in a variety of sizes from about 10 litres upwards. They come in various shapes and may be intended for vertical or horizontal mounting. 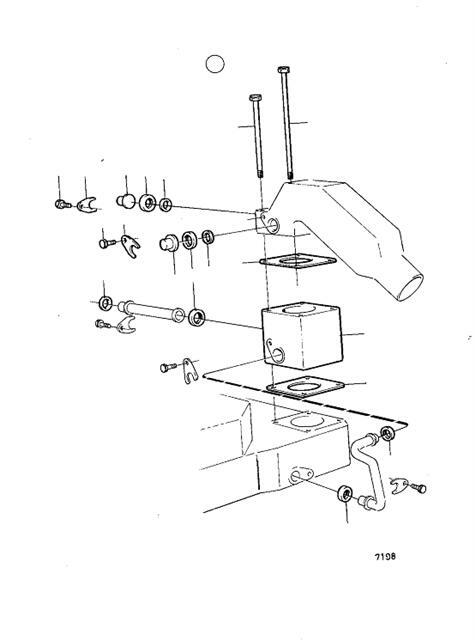 This drawing shows a schematic for a raw-water cooled engine. Fitting the pump on the return side exposes it to lower temperatures. Fitting a calorifier to a Bukh raw water-cooled engine. The principle is that water is circulated between the block and the calorifier, not by breaking into the discharge from the block to the exhaust, which will be cool by virtue of the water that has bypassed the block. Temperatures out of the engine should be around 60 – 65 C, a little cooler than with an indirect cooled engine but plenty for a calorifier. Equipment needed is the calorifier, hoses, and a circulation pump. The pump to use was the Johnson C010P5-1, 12 Volt, 16mm ports, part number 10-35159-3 from Aquafax or T. Norris. This pump has now been uprated to a CM10 magnetically driven version, Johnson part number 10-24501-03. Note that although its duty is stated to be fresh water, it performs well and reliably with seawater. A useful alternative may be the heater pumps fitted to Mercedes and Jaguar cars, frequently for sale very cheaply in on-line auction sites. 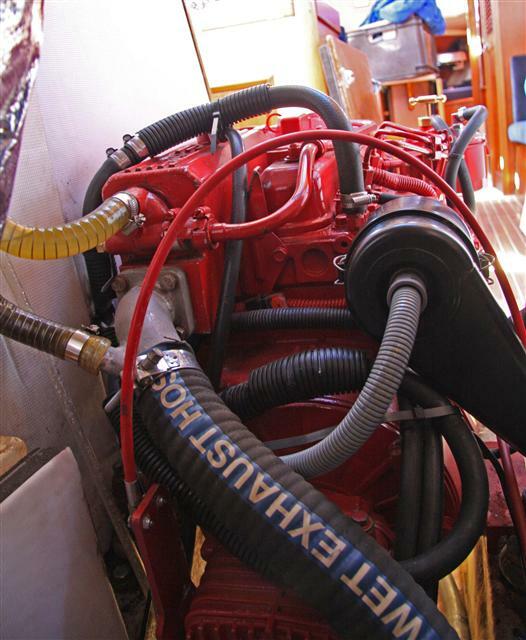 Although the system described is fitted to the Bukh 20 it appears that other engine sizes are essentially identical. Note that the Bukh 10 is too small to run a large calorifier as coolant temperature will be lowered to an excessive extent. Examine the engine’s starboard side. There are two blanked off, screwed fittings in the water system, one on the underside of the manifold at the aft end and the other on the lower aft corner of the block. These are the hot and cold regions, respectively. Standard hose fittings can be screwed into these to replace the blanking plugs. Hot water is taken from the manifold, to the upper coil fitting on the calorifier, out of the lower fitting, to the suction of the pump, from the discharge nozzle and back to the cold fitting on the block. 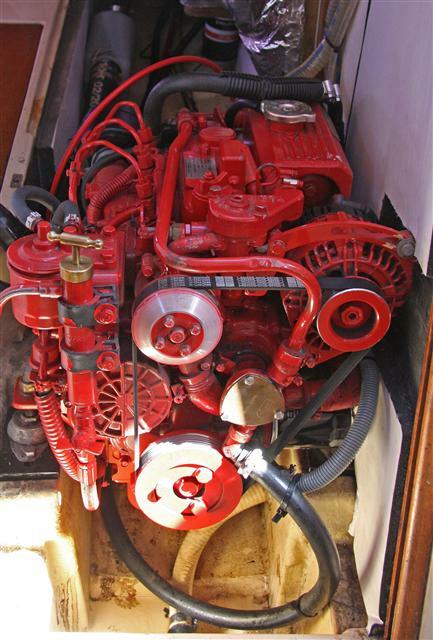 The pump is wired to come on whenever the engine is running. Filling the system is best done by back-filling against the water flow direction by removing the return hose from the block. Put a transparent hose on the block and lift the other end up, then fill the calorifier coils from the discharge side with a funnel raised up a couple of feet above the engine. Usually this fills everything by the time the transparent hose overflows, although there could be an air lock at the top of the block this does not seem to bother the calorifier. In use, with a 25 litre calorifier, it takes about 15 minutes to get the water good and warm but a trace of heat, for testing purposes, is felt within a minute or so. Effectiveness at tickover speed is poor but putting the drive in gear alongside a pontoon helps. After 30 minutes or so the water should be hot enough that you cannot put your hand under the hot tap. Ideally the calorifier should be about 1.5 metres from the engine. It will function at much greater distance, when effectiveness is governed by the system resistance and pump flow. The flow given by the pump is considerable but if you experience problems be aware that the thermo-siphon, if connected the wrong way, is enough to stop it. It is common to include an accumulator teed into the fresh water pump supply to reduce cycling of the pump for minor tap openings or leaks. You would be advised to fit one if adding a calorifier to absorb the thermal expansion of the water. In this case the pump acts as a NRV for the system. Adding a NRV on the hot water side before the calorifier prevents hot water from expanding back into the cold supply, which can be an irritating problem. But in this case the thermal expansion of the water cannot be accommodated by the accumulator near the pump, so you may need to fit a second one after the calorifier. Sometimes there is sufficient elasticity in the hot water hoses that it is not necessary, but if the blow-off pressure of the calorifier’s safety valve is close to the delivery pressure of the pump you may suffer constant dribbles of water from it. 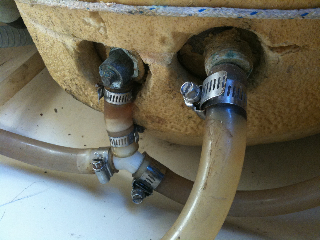 This photo shows the position of the supply hose fitting taking hot water to the calorifier exiting the manifold downwards, and the return hose at the base of the water jacket. In the standard engine the supply hose nozzle replaces a blank plug. The return hose nozzle replaces one of the water jacket drain taps. 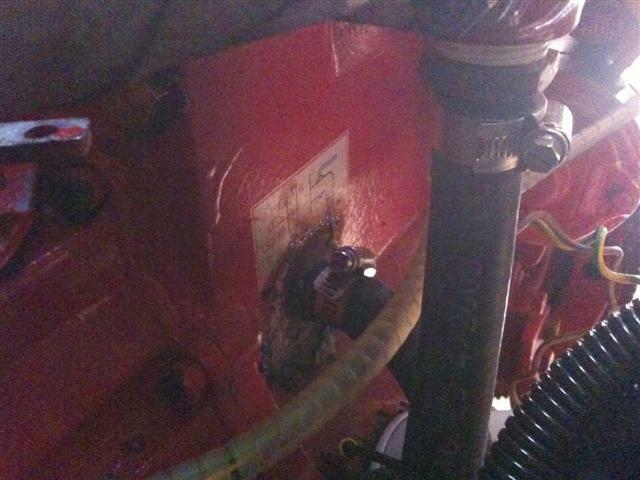 The photograph on the left shows remedial work done to remove the previous return hose nozzle, which had seized in the block. 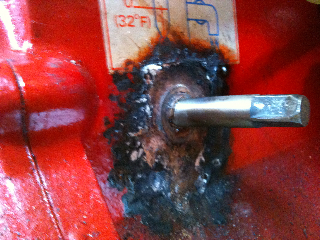 Heat was applied to remove it, followed by re-tapping the thread. On the right the supply nozzle is shown beneath the manifold. The Johnson electric pump is shown on the left, suction to the centre nozzle, discharge exits radially, right hand side.At right the cold water supply to the base of the calorifier and the drain tap. Two hoses can be seen at the T fitting, one from the drain and the other from the pressure relief valve in the top of the calorifier. Both are led to the bilge. Bukh 20 with calorifier installed on a Sadler 32. This simple system was supplied by Bukh but is no longer in production. 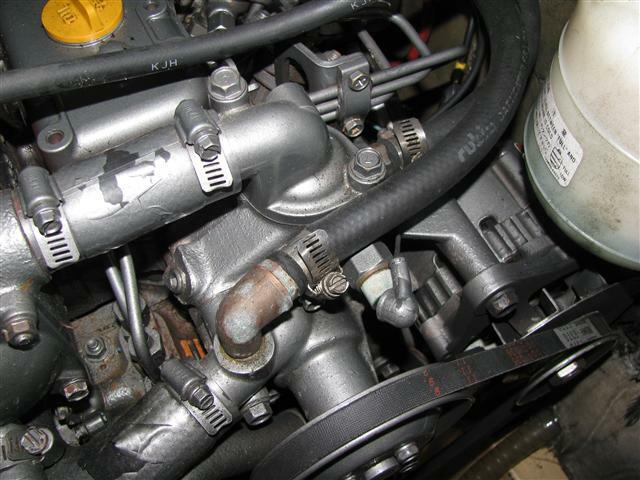 A diverter manifold (grey in the photograph, with two hoses on right-angled nozzles) is sandwiched between the thermostat housing and the exhaust manifold. An additional circulating pump is not required. The raw water pump pumps seawater around the engine to the thermostat housing, where it is diverted to the calorifier and back into the other side of the thermostat housing. A potential problem is that, as the water flow is in series, unlike an indirect system where it is in parallel, a restriction or crushing of one of the hoses to or from the calorifier would prevent coolant circulation through the engine, with potentially disastrous results. Careful siting of the hoses and calorifier is required to avoid the possibility of equipment in the locker reducing water flow. The system works well when the engine is driving the boat at speed but water flow is low at lower revs, when the calorifier fails to heat. Close-up view of the thermostat housing with the diverter manifold. 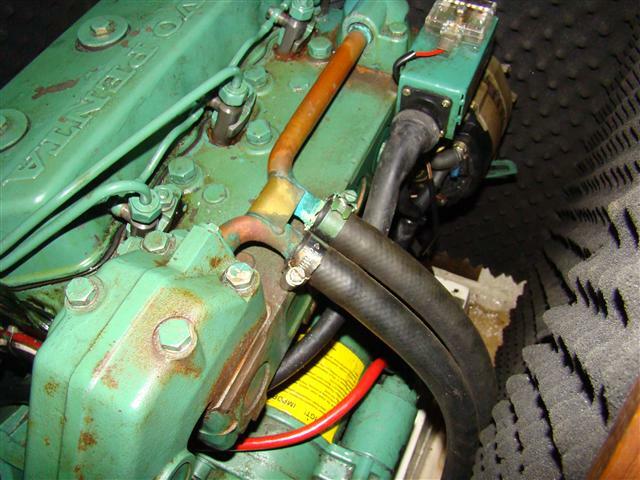 Three photographs of calorifier connections on raw water cooled Volvo 2003 engines. The calorifier is situated in the cockpit locker on the port side of the boat, right in the photographs. The two black rubber hoses at the rear of the engine supply hot water to and return from the calorifier. The two hoses extending out to the starboard side, black and reinforced nylon, are the anti-siphon loop. 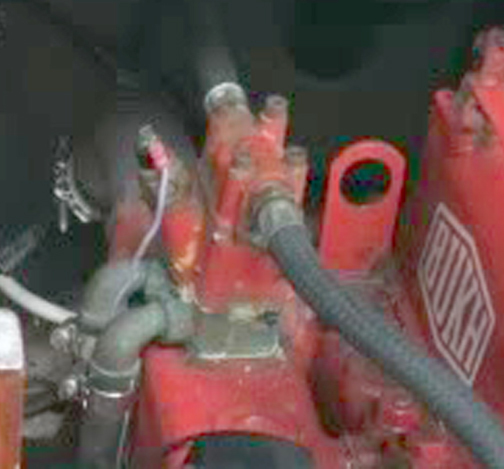 Detail of the calorifier supply and return hose connections on the standard raw-water cooled engine. The copper pipe taking hot water from the thermostat housing to the exhaust manifold is interrupted using replacement elbows. This installation is not the one described in the Volvo document (pdf below). The additional circulation pump described in the document has not been fitted. Front view of the standard engine, without the anti-siphon loop shown above. 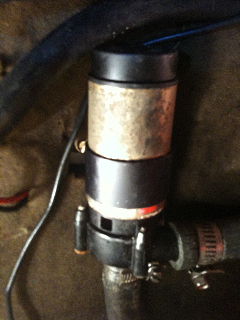 Another view of the calorifier circuit on a Volvo without a fresh water conversion. Seepage of seawater can be seen at the forward joint, a persistent problem with the rubber seals used. The flow path of water in the Volvo Penta is as follows. Two streams of water are required in all raw-water cooled engines, one to effect cooling, regulated by the thermostat, the other, known as the bypass, flowing at all times to cool the exhaust system. On some engines, such as the Bukh, there is an external Y-branch. 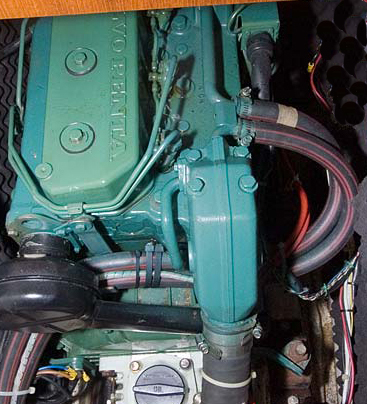 On the Volvo Penta the branch occurs inside the cylinder head. In photo 3 above the pipe from the raw water pump enters the front of the cylinder head. That feeds into a perforated brass tube in the head. At the back of the engine this tube is connected to the exhaust manifold by a copper pipe with three right-angle bends. That can be seen in photo 2 and in the diagram at left. All the water from the pump flows through the brass tube in the cylinder head and into the exhaust manifold until the thermostat opens, theoretically at about 60 C. At this point some of the cooling water passes into the engine and then out through the thermostat into the horizontal tube passing to the exhaust mixer. In photos 1, 2 and 4 the horizontal tube has been replaced by the take-off for a calorifier but it can be seen in the diagram. Known problems include overheating, which can be improved by increasing the size of the holes in the brass tube, and sludge accumulation in the three-bend copper tube. Reduced flow through the exhaust system may be cured by removing this sludge. Thanks to contributors to ybw.com for this information. 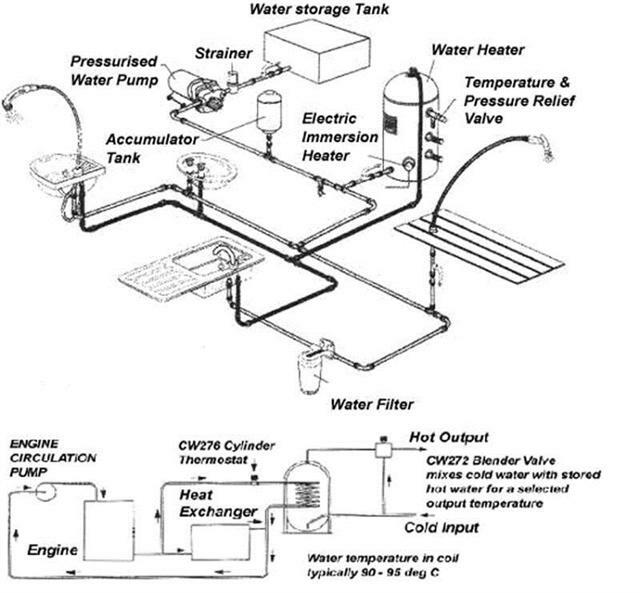 This document describes the equipment and method for converting raw-water cooled Volvos 2002, 2003, MD11C and MD17C to both fresh water cooling and calorifier installation. An additional circulation pump is required. 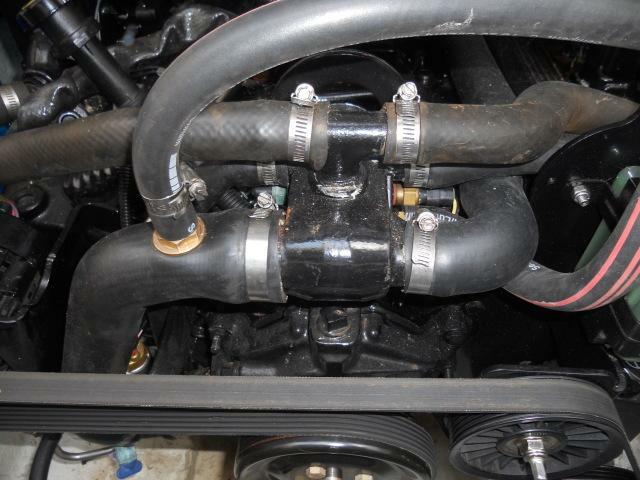 A Martec freshwater cooling conversion as installed on a Volvo MD11C. The Martec is a retrofitted freshwater cooling system that is seen on many raw-water cooled engines. An electric pump circulates fresh water through the heat exchanger, cooled itself by the original raw water pump. A calorifier can be added into the fresh water circuit. 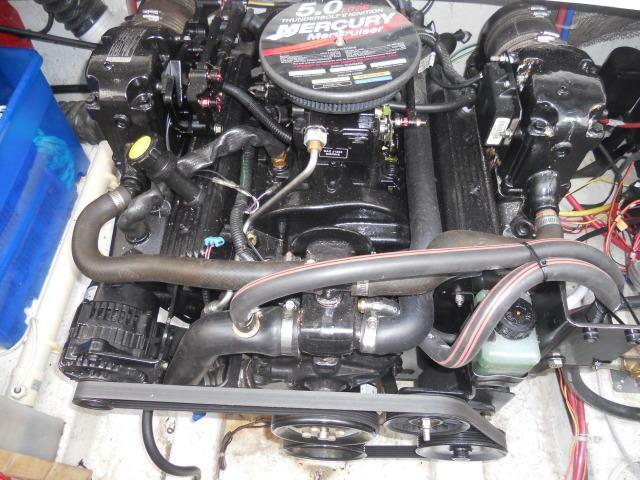 A raw-water system on a 2004 Maxum 2400 SE with a 5.0L V8 Mercruiser and Alpha 1 leg. The addition of the equipment needed to run a calorifier was done by the owner in under an hour (easy DIY). He took the feed from the thermostat housing (a blank plug next to the thermostat) and the return went straight back into the hose using a brass fitting. 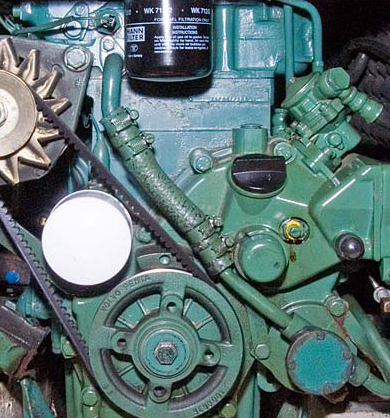 Some engines have a return plug on the water pump. 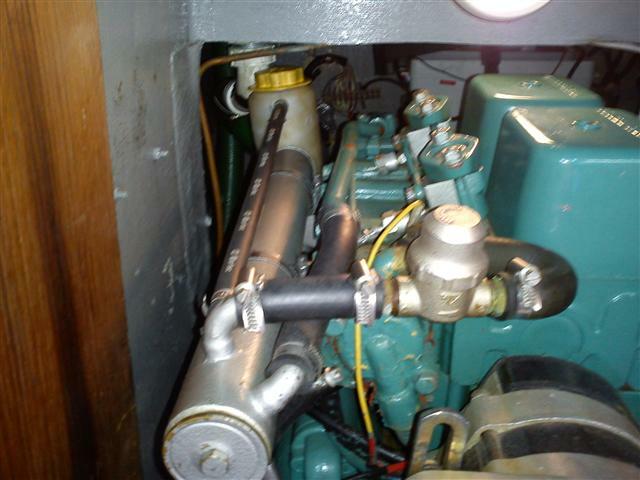 Lancing marine supplied all the parts needed, including heater (rather than radiator) hose to minimise heat loss. 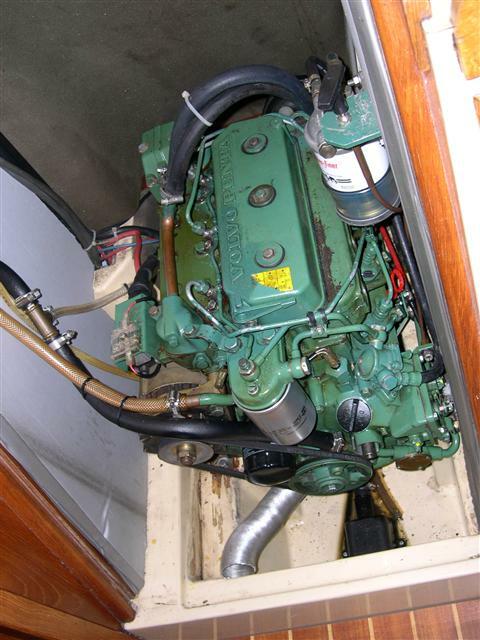 Information is that the Volvo Penta 5.7 gsi engine is similar and can also be retrofitted with a calorifier circuit. 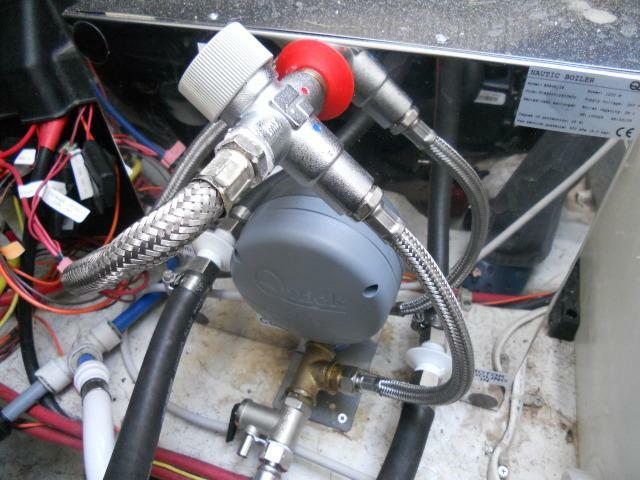 The standard boat’s hot water system is supplied with an immersion heater. The replacement calorifier was supplied by My Boat. Since making this modification hot water is available after about 30mins running at tickover and remains hot over night. In most cases the engine’s circulation pump will have sufficient flow to circulate coolant through the calorifier. A booster pump could be required if the calorifier is sited at some distance from the engine, for example more than five metres. These drawings by Johnson Pumps show a typical layout for an indirectly-cooled engine. 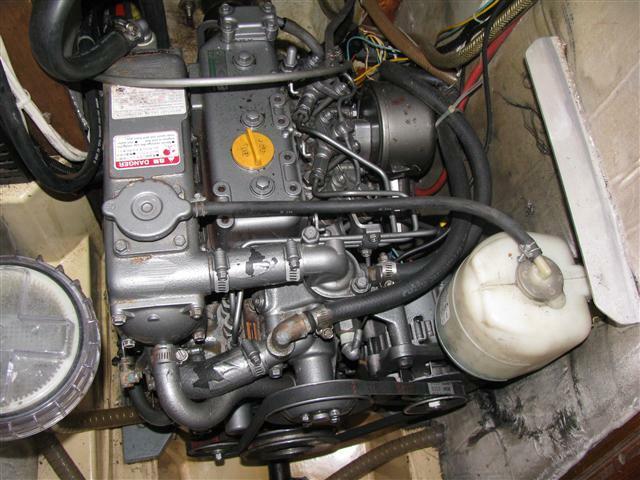 An indirectly-cooled Yanmar 3GM30F with added calorifier hoses, in a Sadler 34. The two black, parallel hoses at the top of the engine are the supply and return hoses to the calorifier in the port cockpit locker. 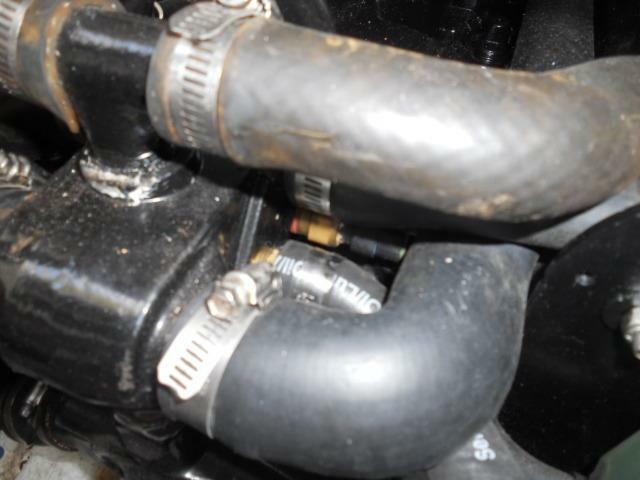 Photograph shows the take-off and return hoses (black) for a calorifier heated by the indirect cooling water of a Yanmar 3GM30F engine. The lower brass-coloured elbow is the supply, taken from a point close to the discharge of the circulation pump. 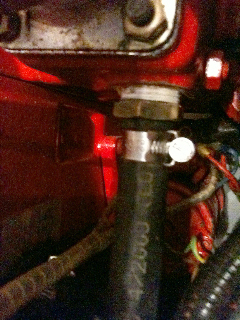 The return hose goes to a point at the base of the thermostat housing. Both nozzles replace blanking plugs that are present on the engine as supplied. Two photographs of a Beta BD1008, 28 HP installed in a Sadler 34. 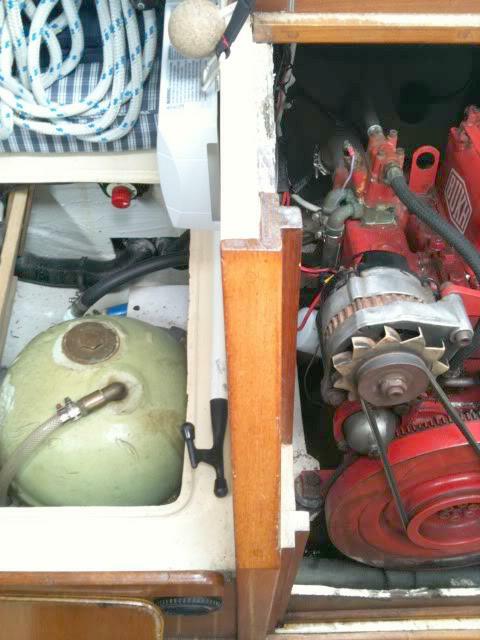 The engine is a very tight fit on the port side due to the location of the heat exchanger and alternator. In this photograph the hot water supply pipe passes over the top of the engine and heat exchanger, protected from chafing by a short length of corrugated plastic sleeve. It leaves the engine on the starboard side (see photo taken from behind) and exits into the port hand cockpit locker where the calorifier is located. From this angle the return hose is not visible. 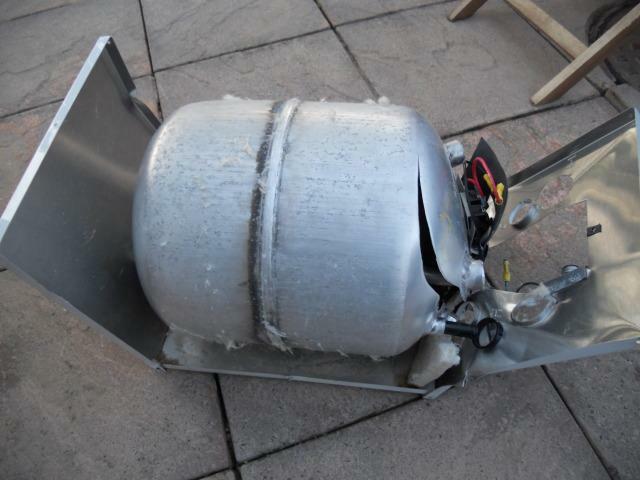 These two photographs show the consequences of allowing calorifiers and accumulators to freeze. It should be remembered that a calorifier cannot be drained simply by pumping all water from the fresh water storage tank. They should be drained from the lowest point via a valve similar to the one shown in the Bukh installation section, above.